guarantees as to delivery date will be made for this protocol, but Marc is now using some very sophisticated hardware/software tools that he and Dave have been developing, and information will be forthcoming as available. TAPR is nonetheless committed in a BIG way to being fully compatible with the AMICON standard, and the complete protocol will be available on our TNC'S. 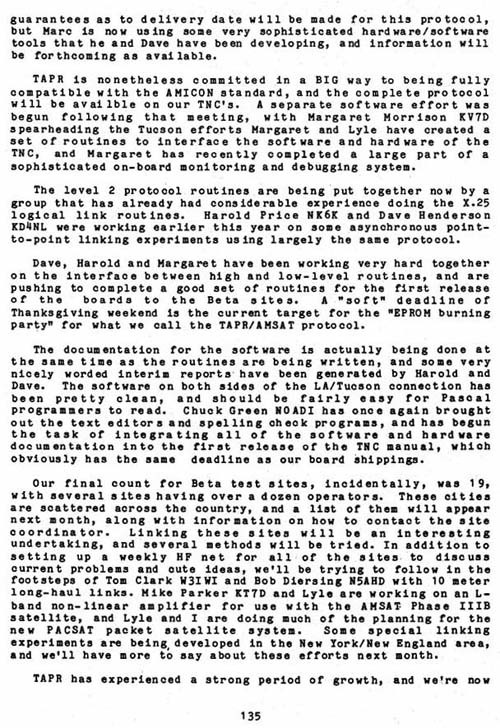 A separate software effort was begun following that meeting, with Margaret Morrison KV7D spearheading the Tucson efforts Margaret and Lyle have created a set of routines to interface the software and hardware of the TNC, and Margaret has recently completed a large part of a sophisticated on-board monitoring and debugging system. The level 2 protocol routines are being put together now by a group that has already had considerable experience doing the X-25 logical link routines. Harold Price NK6K and Dave Henderson KD4NL were working earlier this year on some asynchronous point-to-point linking experiments using largely the same protocol. Dave, Harold and Margaret have been working very hard together on the interface between high and low-level routines, and are pushing to complete a good set of routines for the first release of the boards to the Beta sites. A "soft" deadline of Thanksgiving weekend is the current target for the "EPROM burning party" for what we call the TAPR/AMSAT protocol. The documentation for the software is actually being done at the same time as the routines are being written, and some very nicely worded interim reports have been generated by Harold and Dave. The software on both sides of the LA/Tucson connection has been pretty clean, and should be fairly easy for Pascal programmers to read. Chuck Green N0ADI has once again brought out the text editors and spelling check programs, and has begun the task of integrating all of the software and hardware documentation into the first release of the TNC manual, which obviously has the same deadline as our board shippings. Our final count for Beta test sites, incidentally, was 19, with several sites having over a dozen operators. These cities are scattered across the country, and a list of them will appear next month, along with information on how to contact the site coordinator. Linking these sites will be an interesting undertaking, and several methods will be tried. In addition to setting up a weekly HF net for all of the sites to discuss current problems and cute ideas, we'll be trying to follow in the footsteps of Tom Clark W3IWI and Bob Diersing N5AHD with 10 meter long-haul links. Mike Parker KT7D and Lyle are working on an L-band non-linear amplifier for use with the AMSAT Phase IIIB satellite, and Lyle and I are doing much of the planning for the new PACSAT packet satellite system. Some special linking experiments are being developed in the New York/New England area, and we'll have more to say about these efforts next month.